I think Rome and Venice are the trickiest cities in Italy to eat well in. Meals in these cities are either amazing or terrible, I rarely find anything in between. If you do your research before visiting, you can read lots of reviews and have specific restaurants in mind to try. What I find when I am traveling, however, is that I am often no where near the restaurant I found online (and it isn’t convenient to get to), or I find the restaurant I’m looking for, but I have no reservation and they are booked. What then? In this case I have some tried and tested rules for selecting restaurants in Rome. I also thought I would share some of my favorite places around the city, should you find yourself nearby. 1) Walk away from major tourists sights and squares. You will typically pay double the price for half the quality. If you want to people watch from a cafe in the Piazza Navona or in front of the Pantheon, I recommend enjoying a coffee, wine, or cocktail instead of a full meal. 2) Take a look at the posted menu outside (always do this first, never sit then look). Unlike restaurants in the states, you want to see a small menu with seasonal selections. And if the menu is hand-written, even better! This means it changes daily based on what is fresh and available. IF THERE ARE PICTURES OF THE FOOD, WALK AWAY! I am serious, this usually indicates the restaurant is very touristy and the quality is poor. 3) Make sure the restaurant has posted the “coperto” or table charge. Not all restaurants have this, but if they do, they are legally obligated to post how much it is per person. If one is not listed, make sure you ask. In the past, restaurants would scam tourists by tacking on outlandish table charges. The authorities have cracked down on this in recent years, but it is always best to ask. This is also true for bread charges. If you are brought bread, there is no harm in confirming that it is free of charge, especially if you don’t plan on eating it. 4) Look for (and order) the specialties of the region. Each region in Italy has its own cuisine. And for the best culinary experience, you want to stick to these local specialties. So in Rome I recommend trying the Calcio e Pepe, Carbonara, and Amatriciana. I also love the food in the Jewish Ghetto, especially the fried artichokes and zucchini flowers! A note on selecting gelato – Like picking a good restaurant, you want to avoid gelato shops that focus on display — i.e. brightly-colored mounds of gelato. While this looks pretty, it doesn’t equal quality gelato. In fact, the best gelato places keep their concoctions covered in metal canisters to preserve flavor and constancy. My favorite gelato in Rome is San Crispino, just east of the Pantheon. 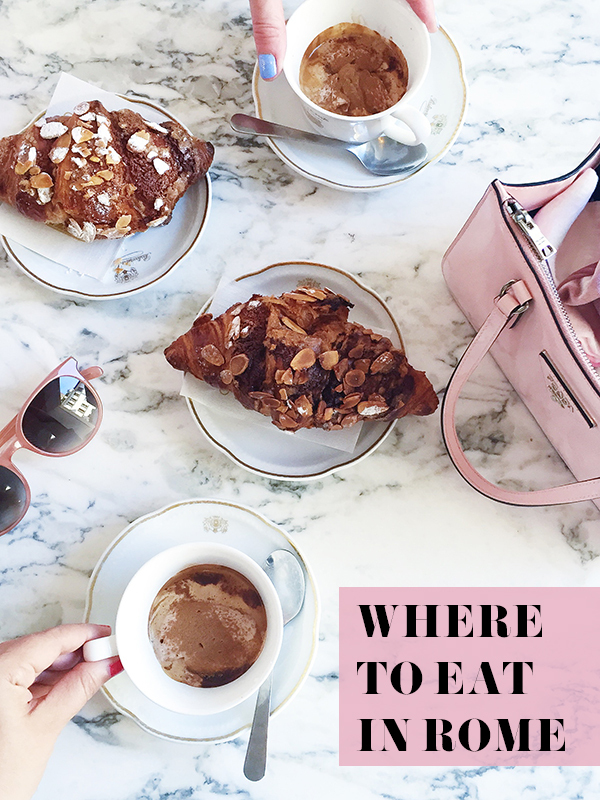 Hands down, home of the best coffee and almond pastries in Rome! If you go, you must try their signature coffee, the “gran cafe.” They take a special homemade cream and top it with fresh espresso and cinnamon (pictured above). It’s amazing! I have been going to Pasta Love for years, so long that they always remember me. 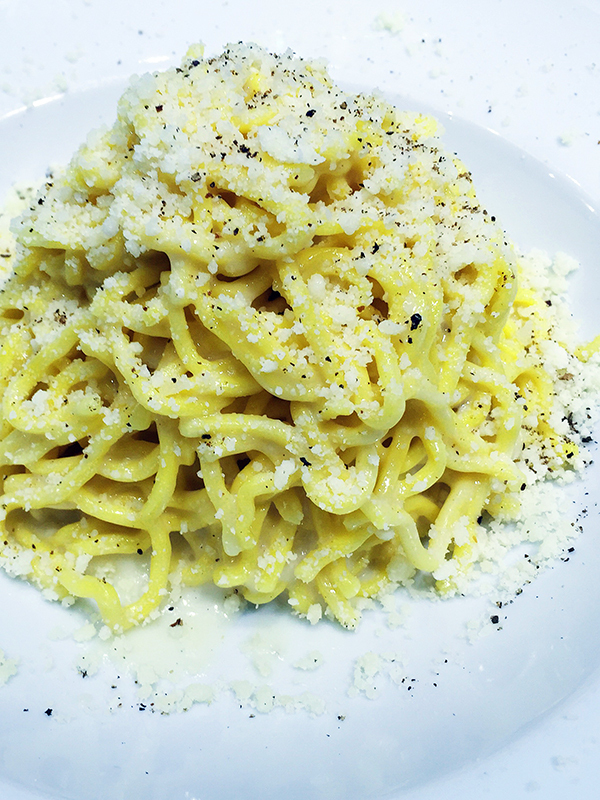 Pasta Love has a good selection of traditional Roman dishes and some more modern concoctions. I love the pear and gorgonzola risotto. The quality, service, and prices are all excellent. My favorite restaurant in Rome and (in my opinion) home of the best carbonara in town! Located in the charming neighborhood of Trastevere, this quaint little restaurant is perfect for a romantic dinner for two or a small group of friends. The best part is you can walk off all of that rich carbonara along the river or through the medieval streets of Trastevere after dinner. I recently discovered this delicious salumeria, wine bar, and restaurant on my last trip to Rome. They specialize in local wines and regional cheeses and meats, but their calcio è pepe is the best in town! True foodies will want to head over to Rome’s emerging food scene in Monte Testaccio (which is an ancient mound of Roman trash – discarded terra-cotta jars), where restaurants like Flavio al Velavevodetto serve seasonal Roman classics with modern twists. Do you have a favorite restaurant in Rome? Please share! I would probably gain 100lbs if I spent as much time in Italy as you do, I don't know how you resist not eating gelato and pasta 3 times a day! Honestly, I have only had gelato a couple times this year! Trust me, you get tired of it after a while! Yay! Thanks so much for following along and I am glad my posts are useful. 14 days is a perfect length for an Italian getaway, you will love every moment. And staying in Trastevere is an excellent choice!